A new study by the Center for Disease Control found just over 30% of fatal car wrecks from 2009-2014 involving teen drivers [aged 16-17] occurred between 9 PM and 6AM. A whopping 57% of those accidents occurred BEFORE Midnight. This calls into the question the practice of many states which while they do limit teen night-time driving, do so only AFTER Midnight. Now, some may go “Well that’s peak driving time, after school, weeknights and weekends”. That’s true to a point but let’s examine the idea further: kids who have been up since 6 AM, in school all day, are having most of their fatal car crashes while they’ve been up and about in the range of 15-18 hours already. There have been countless studies on teens needing more sleep, how their brains haven’t reach maturity yet, and to boot these kids are relatively inexperienced drivers. Putting those factors together is a dangerous combination. 49 of 50 states in the U.S. have restrictions on teen nighttime driving [Vermont, you’re on the way wrong side of this issue]. However, only 23 of those states actually limit driving before midnight. Driving at night puts one at elevated risk for a crash regardless of age but more the young, inexperienced driver who is less adept to challenges they may find on the road. Data in the study provided by the National Highway Traffic Safety Administration [NHTSA] found 93% of the nearly three and half billion teen night driving trips ended before midnight based on their 2009 data. The unfortunate and obvious observation to all this is, we’re letting our children drive when they’re most vulnerable. So what can be done? For one, night-time driving needs to become a larger requirement of Drivers Ed Behind-the-Wheel training. Many states require a much higher percentage of daytime practice driving than at night. If we’re going to keep restrictions where they are now, then DMVs have a responsibility to update their standards to include many more hours of nighttime practice driving a parent or licensed adult. This is a must if we are to keep thing as we are. Others will say restrictions should begin even earlier; that we should limit our teens at so they can’t drive past dark. Dusk can be an incredibly dangerous time as well, with varying visibility levels and the sun is low enough that it can be blinding. Again, that leads to another problem of sort of coddling kids from preventing them from driving at night at all. You then end up with night driving as almost a totally foreign environment when drivers do move past a night-time driving restriction once they get older. Not a good answer either. I advocate more of a middle of the road approach to this. Night Driving Restrictions should be moved down to around 9-10 PM. Kids shouldn’t be out later in a car than you would’ve wanted them running or biking around the neighborhood at night. Most of the same fears we have for our children are still a valid concern anyway, a car as the means of transportation doesn’t take away those worries. It just might be adding to it. You’re probably reading this right now because you got a letter in the mail from the Michigan Secretary of State telling you that you’re eligible for traffic school. Probably for that speeding ticket, that red light you ran, or stop sign you missed. It happens to all of us at one time or another. So now you can make things right and avoids points on your license. Keeping those points off your license will keep your insurance rates down. That’s money in your pocket. It’s also more than just money because if you already have points on your license, a good traffic school course can prevent your license from being suspended for racking up too many points from multiple violations. The points will stay on your record for 2 years and the violation itself will be there for 7 years. That’s a long time. Especially, if your driving record could be a deciding factor for you in a job opportunity. Many employers require a clean driving record to be eligible for certain jobs and you don’t want to miss out on life’s big opportunities because you got a ticket. Typically, violations are eligible for traffic school if they are 3 points or less. You need to have 2 or less points already on your driving record to be allowed into the program. Again, Michigan will send you a notice of your eligibility if you’re able to take the course. You will typically have 60 days to register for and finish the course. A deadline to complete by will also be listed on your notice of BDIC eligibility letter. BDIC Eligibility will only apply to tickets on or after December 31, 2010. You’ll still be responsible for any fines or fees associated with the ticket itself but remember the BDI course is about averting damage from points on your record. For an easy online Michigan BDI course, I recommend I Drive Safely. Nintendo’s Pokémon Go is sweeping the nation, and the world at large. I’ve seen kids clumped in town squares having pizza parties as they use their smartphones to play the game, trying to find Pokémon characters out in the real world. There’s good intentions there, a game that makes kids go outside. It was nice, though the sheer number of people walking around glued to their phones as they played was sort of surreal even by the standards of the world we live in today. Apple has reported, according to an article over at TechCrunch, that Pokémon Go is its most downloaded app in its first week of release ever. All that said, I’m hearing some pretty concerning things associated with the game as well. Some folks in Elk Grove, CA were lured into a serious situation when they tried to meet up with other fans and were instead robbed at gunpoint. Two young men in Encinitas fell off a cliff some 80 feet to the beach below trying to catch Pokémon on their phone. The one that really caught my attention happened in Baltimore; a young man and his friends sideswiped a police car while playing Pokémon Go. Then I read about a Pokémon Go crash in Fall City, WA; then one in Auburn, NY; another across the border in Canada’s Quebec City. As the popularity of this app continues to rise to even greater heights, it may actually become something of a regular cause of accidents. All of this, of course, goes back a regular topic on this blog: distracted driving. Traffic safety experts actually consider there to be three types of distractions drivers can get caught up in: the manual, the visual, and the cognitive. A manual distraction is when you physically do something [grabbing your phone out of your purse] that takes away your attention. A visual distraction is when something else comes into view that takes your eyes off the road [a new text appears on your phone]. A cognitive distraction is anything that causes your mind to focus on something else rather than driving [thinking about a text you received]. Now with Pokémon Go, you have all three of those distractions combined just like active texting but in a new way that requires greater concentration and feeds into the competitive response of gaming. That’s what makes it more even more dangerous. Now if you’re a person who thinks it’s important enough to catch Meowth or Psyduck that you would risk yourself, your passengers, people outside, or even your or someone else’s car, well maybe I can’t help you. However, if you’re a fairly rational person only occasionally just prone to poor judgment, please keep safety in mind. Yes, you “gotta catch em all!” but not behind the wheel. If you’re a pedestrian, look both ways when you cross the street, don’t stare at your phone, the person pulling up to the crosswalk in their car might be on the precipice of finding Charmander and not stop in time. Don’t Pokémon Go and Drive! In Illinois, Adult Driver Education is mandatory if you’re between the ages of 18-20. The good news is these courses are nowhere near as long as when you’re a minor. In just six hours you can have completed all the education requirements to get your license. After successfully finishing your course, you’ll receive a certificate of completion from the Illinois Secretary of State via email [the online drivers ed school only reports your completion to the state, certificates actually come from Illinois]. You can take this certificate down to your local SOS branch office to finish the process to get your license.You’ll also need to bring three forms of acceptable identification [list found here]. Behind The Wheel training is not required for adult drivers, however if you’ve never driven before it’s obviously worth some consideration. We recommend I Drive Safely for its fantastic online Illinois Adult Drivers Ed course. Check them out! The Golden State has always been heavy on rules and regulations. Even with something like learning to drive, it may seem confusing, even overwhelming. With all the forms, fees, and certificates it’s easy to miss what’s really important here: learning the rules of the road to make you a smart driver and getting the behind-the-wheel training to make you a competent driver. If you’re just starting out, all you can think is “What do I do first?” Getting your license sure is a process but it doesn’t have to be a burden. Today, we’re going to break down the process to give you all the information you need in a way that’s understandable and easy to follow. That way you can concentrate on what matters most: learning to drive. Now, to begin you should be at least 15 years old before you begin a California Drivers Ed course. Anyone under 17 ½ must complete a 30 hour Drivers Ed course . This is considered classroom learning, there’s no driving yet. This course teaches rules of the road to your teen, to give them the knowledge to stay safe behind the wheel. Drivers Ed used to be very common in high schools but has become less and less the case over the last couple of decades. An online course like this one is the only way to go these days. Upon completion of the 30 hour course, you’ll be given a certificate of completion by your online Drivers Ed school. -Certificate of Completion from your Behind-The-Wheel Training. -Be photographed for your permit/license. Do all that correctly and you’ll get your Learners Permit. Now what? PRACTICE, PRACTICE, PRACTICE! To be eligible for a road test, you have to hold your permit for a minimum six months [you must be at least 16 for a road test]. In that time, you should continue practicing to drive with a licensed adult [parents of guardians]. You must complete 50 hours of in-car training and 10 of these hours have to be at night. Once the practice driving requirements have been met, you can schedule a road test online here or by calling 1-800-777-0133 [8AM -5PM Monday-Friday]. Be sure to bring Proof of Financial Responsibility [ Proof of Insurance] with you to your road test. You’ll either have to be added to your parents’ auto insurance policy or get your own. Then you just pass your road test and become a licensed driver! To get started down the right path, I recommend DriversEd.com for its California Teen Drivers Ed course. The reason they’re the best in my opinion is not only do they have a fantastic online drivers ed program that’s easy to use on all sorts of devices but because they’ve actually have their own driving school with the largest number of instructors in the state. They cover all facets of Drivers Ed. Check them out! If you’re reading this right now, it’s probably because you already know one of the main points of this article: Arizona loves to give out tickets. Speed traps and Red Light Camera zones in Arizona make up the super vast majority of all citations written. They use speed sensors in the road tied to cameras to catch speeders in addition to police officers doling out tickets. Now if you’re an out-of-state driver, passing through or on vacation then you don’t have a clue this goes on. AAA has gone so far as to declare the entire state a speed trap and has actually added speed trap zones to its printed maps. That is an epidemic! So you’ve got the ticket, what can you do now? My years working with various state DMVs has given me a unique perspective to advise you on the best course of action if you find yourself falling into the Arizona speed trap. Tickets like this can be extremely costly. The fine itself is usually above the $300.00 mark. Beyond that the cost it can add to your insurance can be in the thousands over time. Most courts will allow for a defensive driving course at an online traffic school as long as the offense doesn’t cross over into a criminal driving charge. This is also true in cases of failure to stop, failure to yield, and failure to obey a traffic control device [running a red light]. Arizona municipalities treat this like the business it is and really only care about collecting their money. The state actually allows for traffic school to be taken once a year which is pretty lax. This is mostly likely because they also charge you for the right to take traffic school. Yep, when you sign up and purchase a defensive driving course, you also can expect the traffic school to collect the state fee of $65 and a court fee which can range from anywhere from $1-$150.00 (Please find current court fees listed here). 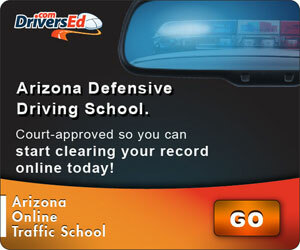 If you have a license in another state but got a ticket in Arizona you must complete an Arizona Defensive Driving course to not receive points on your record. Those state and court fees cannot be avoided! It’s a raw deal but you have to remember this offense will stay on your record for 3 years and probably spike your insurance hundreds of dollars every year. A Diversion Attendance course will clear the offense and the points from your record! Now, if you did not request traffic school, just paid the fine and accepted a conviction, your insurance has likely spiked quite a bit. You can still take a defensive driving course for an insurance reduction which should help alleviate some of the pain on that insurance bill. Hey, anything that helps right? Technology continues to define our experience behind the wheel. The GPS consoles that were the pricey add-on packages in new cars are slowly getting replaced by cell phone apps. Some cars have collision sensors now that can automatically stop before an accident occurs and the hope is that will go standard in a few years. Big things in small packages, they say. The latest change to our driving experience is indeed big in every way: the car itself is changing and soon will drive all on its own. At the forefront of this technological revolution are Google and Tesla but Big Auto can’t be counted out either. GM looks to partner with Lyft to make self-driving taxis a reality. Today I’m going to look at what this means for one of the largest populations of the USA: the senior citizen. My view of self-driving cars for younger folks vs. seniors is vastly different. You see a kid that can’t parallel park and you think “Well parking assistance software really is a plus” but at the same time, will that kid ever really learn to do it themselves? That notion is put on steroids with a self-driving car: do we dull our skills or never fully develop them at all then? Do we end up with a generation of kids who can’t drive well, simply because they don’t need to? Maybe but that’s the dark side of the spectrum. However on the plus side, the self-driving car may be exactly what helps an aging population of Baby Boomers stay independent and at the same time, safer than previous generations of seniors. Typically car crash statistics vary with age. Rates start out high with novice drivers and tend to decline over the life of the population until around age 70. At that point you still see a decreased instance of crash but you also an increased percentage of fatal crashes in seniors from age 70-85 years old, according to studies done by the Insurance Institute for Highway Safety [IIHS]. This change in comparison goes very much against the trends of the population at large. It means seniors are driving less and ending up in fewer accidents but those who do are much more prone to be involved in a fatal crash. So how can the self-driving car change the world for older drivers? They may just be safer option going to the grocery store or around town. Older folks often suffer from ailments that can make their own mobility and rigidity an issue; the ability to turn and look quickly at what’s behind you or in your blind spots essentially. Vision problems often become a greater concern with age as well. 33% of all fatal crashes involving seniors occurred at Intersections while failure to yield, improper left turns, and failure to obey a traffic light round out the top causes of crashes in finding by the IIHS. These are around-town driving issues, things that can happen in someone’s comfort zone. Having the ability to rely on a self-driving car as means to maintain independence while increasing safety in one’s later years is a great, great thing and I welcome it. All that said, self-driving cars aren’t the norm just yet. And we won’t be at a point where putting thousands of computers in midtown gridlock at rush hour is a good idea for even longer. There are still too many scenarios out there developers haven’t even begun to ponder for a self-driving car. We’ll get there but not yet. So what can you do to protect yourself or a loved one if diminishing skill behind the wheel is a concern in the meantime? I recommend taking a Senior Driver Safety course from an established name like AARP. The AARP Smart Driver Course is a wonderful refresher that highlights to seniors the dangers of distracted driving, ailments and conditions that come with age to look out for, the effects of medication of driving, and of course, better driving techniques. It may also save you money on your insurance by taking one of these courses, as many providers offer premium discounts if you do! Texas Drivers Ed: What’s The Block Method? In my first article, I discussed the main points of the Concurrent Method of teen driver education, also known Texas Parent Taught Driver Education course. I also suggested some fantastic online drivers ed schools that are worth your attention and consideration. Today I’m going to take a look at what’s called the Block Method of Texas Teen Drivers Ed. The Block Method is essentially when the entire online teen driver education course is completed before any behind the wheel training is begun. The student is able to apply for a learner’s license [permit] upon completion of the first six hours of the course [the same as the Parent Taught version]. However, the student is not able to transfer into a Behind-The-Wheel driver training school until they successfully complete all 32 hours of their teen driver education course. Reasons vary quite a bit as to why a parent may choose the Block Method over the Concurrent version. One of the greater concerns a parent may have is whether their teen is ready for the responsibility of driving. You know your child better than anyone and you may feel they still have a ways to go in terms of maturity. In that case, Block-style courses do put initial emphasis on learning first.You can rest assured all educational information will be presented your child before they are put into in-car training. This brings us to the other important aspect of the Block Method: use of a TDLR approved driving school. Quite frankly, many parents are scared about the prospect of teaching their teen to drive. They do not look forward to that moment of being the passenger, let alone the instructor. The Block Method requires 14 of the required 44 hours of in-car training to get licensed with an accredited Behind-The-Wheel School. This opportunity allows the teen to have their first few hours driving with a professional licensed driving instructor. This can take a lot of pressure off the teen as their skills will have begun to develop before the parent takes over for the remaining 30 hours of the in-car training. You can also alternate those instructor based driving lessons with your own parent led instruction so that your teenager makes greater strides and progress between purchased driver training. For a great Texas Online Drivers Ed course, we recommend DriversEd.com. Getting a drivers license in Colorado is a bit of a different experience from other states to say the least. It does not, however, have to be a difficult one. There’s so much to know and understand regarding what you can and can’t do at different age ranges to get your learners permit or drivers license. I’ve created this site to break down state and Colorado DMV requirements to help you understand what you have to go from riding your bicycle to driving a car! I’m going to break this all down by age requirements so you understand what you need to do. Remember, Colorado requires any minor must hold their learners permit for 1 year before they are eligible for a road test. At 15 to 15 ½ years old, you must complete a 30 hour drivers ed course [like one here ] to get your permit. Quite honestly, it’s also the fastest way to get your license. You can get your permit as soon as you complete your drivers ed course. The right school’s final exam will also count as your written permit test so you won’t have to take it at the DMV. Now if you’re 15 ½ you’re able to either take the 30 hour drivers ed course OR you can a 4 hour in-classroom Driver Awareness course to get your permit. The drawback to waiting to take the Driver Awareness course is you now will be at least 16 ½ possibly 17 before you can take a road test, because again you have to hold your learners permit for at least a year before you can get a license. Okay, so now if you’ve got your permit. Remember you have to hold your permit for 12 months no matter how old you are before you can take a road test. Here is what’s involved in getting your license by age. Your teen needs to complete 50 hours of behind the wheel training which is documented on logs they’ll get when you receive your leaners permit. 10 hours have to be completed at night. 6 hours of driver training must be completed with a Behind-The-Wheel School. They’ll provide you with a Behind -The- Wheel training certificate that will also be one of your last requirements prior to a road test [sometimes called a drive test]. All in all, while there’s a lot to this, the above should help make sense of what’s required. I believe in an early start to drivers ed for 2 reasons. First, the 30 hour courses provide an in-depth education for your teen which will build a strong foundation in the rules of the road. A 4 hour awareness course will never make up for all the material covered. Second, that early start with a drivers ed course at 15 will allow your teen more time to practice behind the wheel training without necessarily falling out of place with their peers. Procrastination can lead to teens that never get licensed.